With the flaws related to the recent final appeal that had to be coaxed out of the US Coast Guard hierarchy, I sent a response to CG officials last week maintaining that their response was wholly inadequate. The September 1, 2015 response from the U.S. Coast Guard regarding the above-referenced FOIA Appeal is flawed as the Coast Guard’s efforts to fulfill the original request was inadequate/incomplete and this matter should still be considered open. It is my understanding from speaking with several retired Coast Guard officers that it is a routine procedure once a cutter has been decommissioned from Coast Guard service for the associated records and documentation for that ship to be removed from the Office of Cutter Forces and the library of the Surface Forces Logistics Center. 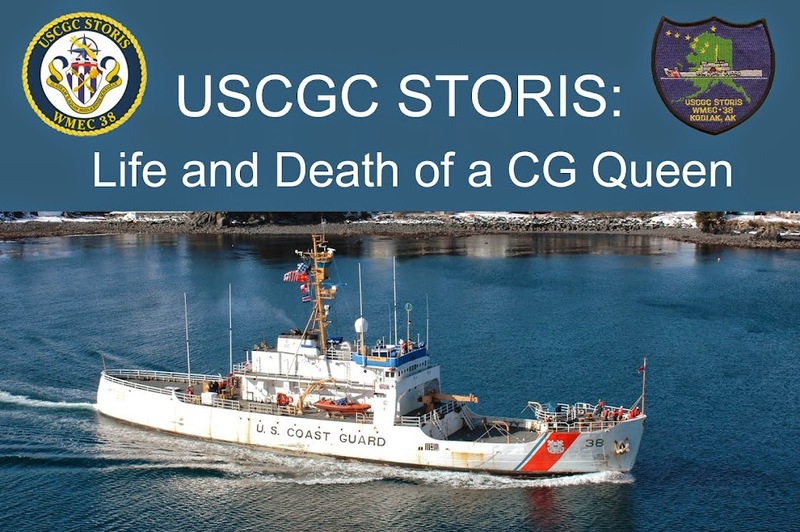 At the time of my original FOIA request of Nov. 4, 2013, the CGC STORIS had been decommissioned almost seven full years. Therefore, as a matter of procedure, the records associated with CGC STORIS would have been purged from the Office of Cutter Forces well before my inquiry. Yet the Coast Guard has responded that a comprehensive search of Cutter Forces records was undertaken, at a facility – according to what has been explained as standard operating procedure – that would no longer serve as a repository for those records. And while the FOIA response from USCG specifically discusses the Office of Cutter Forces, what about the technical library at the Surface Forces Logistics Center in Baltimore? The WMEC branch in Norfolk? Or the Surface Forces Logistics Center in Oakland that handled her mothballing? The overall question becomes a matter of what the full procedure for the records purge involves. Are the records for decommissioned cutters disposed of/destroyed or are they moved to a separate archival facility somewhere else, such as the National Archives and Records Administration? The only records for STORIS that are immediately identifiable within NARA holdings are some Night Order books, many ship’s logbooks in Washington, DC, and a drawing set at the NARA facility at College Park, MD. Again, to say that a full search of the Cutter Forces facility was performed when that facility as a matter of procedure would no longer hold the requested records is quite disingenuous, especially without an answer as to where these records went as a matter of standard procedure. There is also the matter of the “completeness” and “reasonableness” of the described search. Attached is an email from retired Commandant Papp to Jim Loback, president of the STORIS Museum. Copied on this email is current Commandant Paul Zukunft. While I have had a copy of this correspondence since it’s original transmission, as it was forwarded to me by Mr. Loback, the Coast Guard did not send this correspondence to me as part of the records requested through the FOIA request. It’s likely that there are other such communications and documents within Coast Guard holdings that have not been released. This includes communications between the General Services Administration staffers handling the auction of STORIS and Jeff Beach the manager of decommissioned cutters/boats. There are references to haz-mat documentation and correspondence involving USCG in GSA materials released through FOIA that were not released by the Coast Guard. Additional correspondence from GSA sent the morning after closure of the STORIS auction shows that GSA sales official Tonya Dillard sought permission from Jeff Beach of the Coast Guard to accept the (below reserve) bid of $70,100 for the ship (see attached). This correspondence stream is also missing from the Coast Guard materials released to me. Another critical document not provided by the U.S. Coast Guard is the “Specifications for the Lay Up Preparations of USCGC STORIS (WMEC-38) May 2007,” prepared by the U.S. Coast Guard Maintenance and Logistics Command Pacific Naval Engineering Division. This document was obtained by searching other U.S. government resources, and was not provided by the Coast Guard. This is particularly problematic considering it contains specific information directly related to the request. It also relates back to the concerns about the adequacy of the FOIA search related to USCG offices and technical repositories. These examples clearly demonstrate that there are materials that exist related to CGC STORIS and her excessing, sale and disposal that the U.S. Coast Guard did not send in response to my FOIA inquiry. The validity of the Coast Guard’s claims in relation to this FOIA request and its fulfillment come into question when there are such gaping holes across the response. Missing items and questionable search locations are cause for rightful skepticism regarding the adequacy and thoroughness of the search. STORIS was a nationally significant historic ship listed on the National Register of Historic Places. This recognition should have encouraged her preservation and interpretation rather than expedited destruction at the hands of the Federal Government bureaucracy. There is keen interest in how this great ship was allowed to be destroyed and an expectation of full transparency from this administration. I have received notices that Commandant Zukunft, his executive assistant and others have received the information. CAPT Michael Ryan, the executive assistant sent a note over the weekend officially acknowledging receipt on behalf of ADM Zukunft. After a further review, additional materials are clearly missing from the CG response. Thank you for your response, particularly on a Sunday morning. As I continue to pore over the documents that I have received from the various agencies involved with the excessing, disposal and export of CGC STORIS, some additional materials are also conspicuous in their absence. This would be correspondence involving RADM Fred Kenney, former chief counsel for the U.S. Coast Guard. I personally addressed inquiries to RADM Kenney related to various aspects of the situation with STORIS and there does not seem to be any materials from the Coast Guard that reflect RADM Kenney's involvement. Meanwhile, there are communications involving the Maritime Administration where RADM Kenney is copied -- correspondence which I received through FOIA from MARAD -- yet those materials do not appear in the CG's FOIA release to me. Your assistance in this matter is appreciated. So now we wait some more, as RADM Marshall Lytle, the JAG and Chief Counsel for the CG, is apparently preparing a response on behalf of the CG according to CAPT Ryan. Here is the seventh and final release from the General Services Administration, sent to me on September 30, exactly one year to the day that the first release came out. There are 468 pages of information in this release, hence the long processing time to review and get this information out. As before, in prior releases, there is a lot to read, but the information is important to review as it reveals more of the machinations that allowed STORIS to be illegally exported to Mexico for scrapping. As other FOIA releases have demonstrated, there was a callous lack of concern for the accomplishments and significance of STORIS and the contributions of her crews over her 65 years of service to the U.S. To the Coast Guard, she was a financial liability. To the GSA, she was nothing better than a beat-up old file cabinet. It is repeated throughout the documentation that selling the ship for chump change to a questionable scrapper of dubious background was in the government’s best interests. This, despite the ship’s listing in December 2012 as nationally significant on the National Register of Historic Places. Federal preservation law (National Historic Preservation Act of 1966 16 USC 470) strongly encourages the preservation of nationally significant historic properties, particularly federally owned properties that are being transferred to private ownership. The bureaucrats within GSA didn’t care and the CG officials involved weren’t much better. The EPA officials at best couldn’t be bothered to look deeper into the concerns we expressed over the legality of the ship’s sale and export, instead choosing to accept seriously flawed paperwork that they should have immediately recognized for its faults. Then there were the MARAD officials, who sat back while all this was going on and let it happen, knowing full well that STORIS should have been under their disposal purview (40 USC 548), that the ship undoubtedly contained PCBs and other regulated hazardous materials, and that the export of the ship to Mexico violated federal law (§3502 of the Duncan Hunter NDAA of 2009). It is interesting to note that the auction for POSEIDON took place just a few months after the former CGC ACUSHNET (WMEC-167) was auctioned off by GSA. We are certain that, by virtue of her age and construction, that ACUSHNET likely has on board latent and undocumented hazardous materials that should have made her open, unrestricted auction illegal under federal law. As you may recall, ACUSHNET is now for sale in Anacortes, WA, at the center of a federal criminal case involving the buyer and his alleged activities in defrauding a wealthy and vulnerable widow out of approximately $1 million to buy the ship and for personal expenses for himself. The POSEIDON lawsuit was underway in early 2013 as GSA was preparing to fast-track the sale of STORIS to expedite her disposal from federal ownership. Again, we know that STORIS also contained asbestos, red lead and PCBs above federally regulated levels as she had on board significant quantities of undocumented materials such as abandoned cabling. Earlier documents released through FOIA demonstrate that there was a clear and conscious effort to avoid testing STORIS (and ACUSHNET, as well as MACKINAW and likely other cutters…) according to accepted protocols that would have identified latent hazardous materials. Instead of random sampling as required by law, the sites chosen for PCB were deliberate in that the sites chosen would have little chance of testing positive for PCB content. These included samples taken from items manufactured well after the federal PCB ban went into place. Strikingly, no samples were taken from paints (older paints used PCBs as flame retardants) or the electrical system (where PCBs would have been used for their heat resistance in cooling oils and insulation). The presence of haz-mat was verified by members of STORIS’ final crew. Yet STORIS was sold as miraculously PCB free with very sparse and questionable paperwork. What do all these transactions have in common? Tonya Dillard of the General Services Administration. She was in charge of sales for all of these questionable transactions. In fact, in this FOIA release, there is a huge reveal on page 205 when Tonya Dillard reveals that the GSA does not release hazardous materials documentation to the buyers of vessels who purchase them through GSA Auctions. This is outrageous and goes right back to the POSEIDON issue discussed earlier in the packet of information. Dillard was involved with the auction of ACUSHNET, POSEIDON and STORIS. It would seem that Tonya Dillard plays fast and loose when it comes to disposing of ships containing hazardous materials, despite federal laws that are supposed to regulate these substances. These regulations include the Toxic Substances Control Act of 1976 and the strict regulation of PCBs. “The USCG is precluded from the “distribution in commerce” of PCBs or items containing PCBs in concentrations above specified levels. Under the Federal Property Management Regulations (FPMR), the GSA regulates the transfer of excess personal property through the utilization and disposal cycle defined in 41 CFR 102-36. The transfer of any property that is contaminated with hazardous materials such as PCBs, asbestos, or lead-based paint shall be in accordance with the guidelines established in 41 CFR 101-42.” STORIS likely contained all of these materials and so does ACUSHNET. On pages 347-351, there is a tersely worded email from Jeff Beach of the Coast Guard dated 9/27/13. Beach is demonstrating concern and a lack of patience with the buyer and GSA, disagreeing with GSA officials that the failure to move STORIS from the SBRF was because the move was beyond the control of the buyer. Beach points out that he believes the delay was caused by the buyer intentionally holding the ship at the SBRF to avoid the costs of moving the ship to a commercial berth while working out his plans for the ultimate disposition of the ship. Beach is concerned as the Oct 1 fiscal year cutoff is looming and the potential costs to the CG were appx $70K if the ship was not moved. As it was, she stayed in the SBRF for almost an entire additional month and there has never been any revelation as to whether or not the CG, the buyer or any other party had to pay for that extra storage time. Granted the government shutdown started Oct. 1, but the staff at SBRF was not affected by the shutdown and were open for business. Beach requests in his email of Sep 25 that the sale be voided and control of STORIS returned to the USCG. Dillard and GSA refused to void the sale, instead sticking up for the buyer, Mark Jurisich of U.S. Metals Recovery. Here, it would be a valid question to ask why Tonya Dillard and GSA were defending the buyer and his interests before that of the agency that had excessed the vessel and had the immediate need to move the ship or incur a financial penalty for the ship remaining in the SBRF. The correspondence largely speaks for itself. Again, from the original filing of this FOIA on Nov. 4, 2013 to the final release on Sept 30, 2015, it was just short of two years to get this information. STORIS is gone, but we still deserve answers. Hopefully, we can get some justice, especially if we can get this information in front of the right government investigators, particularly the Government Accountability Office. We need the STORIS Act legislation to pass to initiate the audit of the ship recycling program of the US Maritime Administration. Again, MARAD let this all happen, even though its own officials questioned the PCB-free designation of STORIS just prior to her export. Hello again.... Another important piece of information for you to be aware of is the high bidder will be using the vessel as scrap metal. The MOA with the State Historic Preservation Office and Coast Guard (attached) put the onus on the Coast Guard to preserve the history rather than putting restrictive covenants on the vessel itself. This demonstrates once again that GSA cared not one bit that STORIS was officially designated as nationally significant and listed officially on the National Register of Historic Places. They fell back on the Section 106 MOA that, at the time of the auction, was almost seven years old. Circumstances had changed since the original creation of the document, yet GSA charged ahead with their expedited disposal of the ship based on that agreement. Whether that was an appropriate course of action remains to be determined. And once again, just because they could do that doesn’t meant they HAD to do it. This is all about getting rid of the ship ASAP with no concern for her history. Lazy, indifferent, incompetent bureaucrats… Another key aspect of this communication is that GSA officials knew immediately that the intent for STORIS was scrap. How did they know? Why did they not refer to the restrictions for STORIS to be recycled domestically per Section 3502 of the Duncan Hunter NDAA of 2009? P 25-31 – Email exchange between the buyer, GSA, Coast Guard and MARAD related to Department of Defense permission to export the ship to Mexico. CG and GSA expressed belief at one time that the buyer was free to move the ship wherever he wanted to as it was a privately owned vessel. However, the State Department said otherwise and considered STORIS a warship, limited by International Trade in ARms restrictions. Here the buyer refers to pressure from “my people.” Who are “his people?” We know that the buyer had to have $50K wired in from a foreign source to finalize purchase of the ship. Nowhere in the GSA paperwork does the government identify the source of the foreign money, as required by the Bank Secrecy Act of 1970 or the PATRIOT Act of 2001. Who are the foreign interests behind the purchase of the ship? P 31-32 – Discussion between the buyer, GSA and CG related to the need for a Certificate of Financial Responsibility (insurance for oil pollution release).Also, STORIS had to be removed from the SBRF before the new fiscal year beginning Oct 1 in order to prevent the USCG from being billed for additional storage fees. This is an important ongoing topic of discussion. P 33- 42 – Correspondence between the State Department and CG related to STORIS’ decommissioned status. P 35 has a comment from Tonya Dillard stating the sales contract will not be voided based on circumstances beyond the buyer’s control. Further discussion with another GSA official, David Robbins, the Director of Personal Property Management. P 42-71 Discussion between MARAD and CG about the possibility of CG being stuck with another year’s storage fees if the ship is not removed by Sep 30. Continued discussion related to the ship’s military decommissioned status with the State Department’s involvement. Delays because the ship is anchoring down the row at SBRF. P 67 has a comment from Robbins re the sale to US citizens only with the International Traffic in ARms regulations. Page 66 refers to GSA officials discussing military sales constraints which would limit the scope of sales to U.S. citizens. If GSA is selling these items, shouldn’t they be better versed in items they are handling and selling off? P72-78 Correspondence from Tonya Dillard of GSA stating that Jim Loback of the STORIS Museum was working to see the purchase contract voided so that the museum could attempt to take title to the ship. Jeff Beach at Coast Guard indicated that the CG would be “giving the property to Mr Loback’s agency once the contract was voided.” So what you have is an international mess where GSA sold a contaminated ship to a buyer who had to go through official channels to export the ship to Mexico, a ship that was considered a warship by the State Department. The government allowed the export to proceed even though there were issues with her status as an armament and the fact that §3502 of the Duncan Hunter NDAA of 2009 should have precluded her export altogether. The GSA and government could have facilitated the transfer of STORIS to the domestic nonprofits, which would have preserved the ship, a designated national historic property. Instead, they opted to follow a more complicated path that broke several federal laws and ended with STORIS destroyed on a beach in Mexico. They could have helped facilitate the preservation of the ship, yet they went through all the trouble to facilitate the illegal export of the ship by a sleazy buyer from a questionable “metals recycling” company. The government enabled the buyer to try to extort the nonprofits interested in preserving the ship even as he tried to find a way to circumvent domestic recycling and labor laws to cut the ship up in California using migrant labor. Then, when domestic recycling options became nonexistent, he exported STORIS to Mexico with the government’s blessing. P79-104 – More discussion about the demilitarized status of STORIS and the issue of exporting out of the country what the State Department considered to be a warship. A FOIA request I submitted to the State Department has not had much in the way of a response other than a denial for expedited response. As we know from watching the situation with former Sec of State Hillary Clinton and her emails, the State Department does not respond to requests for information related to wrongdoing or email reviews. P 106 -108 – Discussion between Heather Bischoff and Tonya Dillard of GSA regarding difficulties the buyer, Mark Jurisich, was having registering STORIS with the CG Vessel Documentation Center. Dillard also mentions that Jim Loback had called asking why the ship hadn’t been moved and the particulars of Jurisich trying to extort the STORIS Museum, considering the known high costs of domestic scrapping. P109 – Request from Mark Jurisich to Tonya Dillard asking for a phone call. Phone calls are convenient as they evade the paper trail that can be picked up by FOIA requests. P110 -115 – Request from Tonya Dillard to Mark Jurisich for an update re removal of STORIS from the SBRF. P116-120 – More discussion regarding paperwork prior to the ship’s removal. P122-127 – More discussion between Dillard and Jurisich re COFR and removal of the ship. P128-131 – Discussion related to towing issues and a contact within the San Francisco CG Office for Waterways Management. This would have involved issues related to bottom-cleaning and invasive species protection requirements. STORIS was towed directly from Suisun Bay to Ensenada without stopping for a bottom cleaning. Recent documentation obtained through FOIA specifies that ships in the SBRF are to have their hulls cleaned every five years. STORIS was in the SBRF for over six without being touched. P 132-133 – More about COFR from Jurisich to Dillard, Dillard out of office. P134-157 – Correspondence shared by Jurisich with his insurance underwriter discussing the COFR. Jurisich explains that STORIS has been laid up in better condition than any other CG ship at SBRF, according to MARAD officials. He indicates the sea chests are blanked off and the bottom cleaned. He also states that ship has been cleaned of all PCBs (which we know is categorically not true). Plan at that time was to tow from SBRF to Alameda. P 159-179 – Here is the interesting inclusion not related to STORIS, but the NASA barge POSEIDON, used to transport Saturn V stages and the space shuttle’s main fuel tank. Have to laugh cynically at : "Thank you for your recent Freedom of Information Act (FOIA) request. The Obama Administration is committed to an open and transparent government. Accordingly, the US General Services Administration (GSA) is doing its part to make government more open, accessible and transparent…” Ha! What a joke. P 180-182 – Copies of correspondence between Jurisich and Sause towing. P 184-199 – Bureaucratic runaround among GSA officials as to how to respond to the FOIA request submitted by Jon Ottman (me) on behalf of the STORIS Museum to identify the buyer. It took them several weeks to respond and, by then, the buyer had already contacted the STORIS Museum through an intermediary to start his extortion attempt. P 205-213 An interesting exchange between Jeff Beach of Coast Guard and Heather Bischoff of GSA related to the collection of haz-mat documentation related to STORIS that was being gathered to respond to inquiries from the Environmental Protection Agency following the ship’s export. This was prompted by the public outcry related to the ship’s export when it was known she contained latent hazardous materials and PCB-containing materials higher than the 50 ppm regulated threshold. P 217 – Message from Jeff Beach of CG to Chris Rollins, EPA inspector in Region IX related to the PCB status of STORIS. The PowerPoint presentation referenced demonstrates the removal of 20 linear feet of black foam insulation that, upon removal, magically rendered STORIS free of PCBs. This is, of course, not true as there was a significant quantity of undocumented material on board the ship that still contained PCBs. The PCB reports referenced in the email are also erroneous as discussed earlier, as the CG’s protocols and methods for testing were wholly inappropriate. The testing process seems to have made a very conscious effort to complete avoid testing any location that had a high probability of finding PCBs. Nothing in the electrical system was checked, for example. P 218-229 – Correspondence among GSA officials related to PCBs on board STORIS following an inquiry from Polly Parks, an official with European Metals Recycling. Ms Parks’ correspondence to the government agencies expresses concern and skepticism about the legality of the STORIS export and the ship’s status as free of regulated PCBs. GSA. Tonya Dillard of GSA blows off the significance of Ms Parks’ inquiry, stating that she is not a federal official. However, Ms. Parks was dead-on correct in her assessment of the situation after having read a newspaper story in Stars and Stripes about STORIS’ export to Mexico for scrapping. Again, the government falls back on flawed PCB sampling documentation. P231-240 – Additional discussion related to the correspondence from Ms Parks from EMR. Tonya Dillard tells Jeff Beach that he should not comply with the request from Ms Parks for documentation that proves STORIS is free of PCBs. “Polly Parks does not represent a federal agency. I would not adhere to request unless you receive consent from your legal counsel. Please do not think I am trying to tell you what to do just trying to offer a little advice,” she said. About that Obama Administration transparency… From prior email releases, we know that Beach did send the email but tried to electronically recall it before Ms Parks was able to open it (see P 255). His efforts were unsuccessful and the information was successfully obtained. P 256-259 – Departure report request from MARAD. P 260-265 – Request for assistance with STORIS following the report of radioactivity on board the ship. P 266-288 – Going back, acknowledgement of the bid deposit from STORIS Museum and associated discussion involving Mark Begich’s office after the auction. The correspondence shows once again the deceptive answers that GSA even gives representatives of Congress. They can’t give a straight, honest answer about what they are doing with STORIS and their intentions if their lives depended on it. Subterfuge is the MO. And again, GSA knew right away STORIS was destined for scrapping despite all the sources we consulted with stating that it was going to be cost-prohibitive to do that stateside (within the law) and that there was no way she could be exported to Ensenada. Additional discussion involves the process and rationale for selling the ship at below reserve price. P 289-320 – Continuation of the discussion above, bringing in a newspaper story “blasting GSA” for the sale of the ship. “The problem is the guy did not have credentials to become or be deemed a museum entity so after storing the shop for several years in anticipation of the guy becoming eligible for museum status, the Coast Guard asked GSA to dispose of the property.” No, the problem is that GSA lied to Jim Loback (AKA “That guy”) about helping us to get STORIS. Jim had a decorated 21-year military career in the Coast Guard, Air Force and Army that included a Bronze Star. He worked tirelessly for over seven years to save STORIS for preservation and interpretation. GSA said they’d help us, that we had a 99 percent chance of getting the ship. Heather Bischoff said we may have to pay a modest cost (the museum that got the CGC ACACIA [WLB-406] here in Michigan paid $5,000 for her) but she said GSA wanted us to get STORIS. Instead, they fell back on that seven-year-old Section 106 MOA and kicked us to the curb. GSA also refused to acknowledge that we couldn’t be a full-time museum without the ship as the main facility to house the organization. Again, they said they would work out a waiver, but fell back on the Section 106 MOA. Arrogant, ignorant, disrespectful and incompetent don’t even begin to sum up the GSA bureaucracy. P320-327 – Press inquiry related to STORIS. This was the newspaper story related to California Ships to Reefs, the group interested in securing STORIS, PLANETREE and IRIS for reefing near Santa Catalina Island. More recycling of previous correspondence. Again, this whole series of releases is wasteful in the amount of extra white space and repetitive information. Keep in mind that this is the FOIA that GSA wanted to charge me over $10K to fulfill. Then the correspondence returns to more evolutions of earlier repetitive discussion. P340-334 – Discussion between CG and MARAD regarding paperwork and receipts to authorize release of the ship to Mark Jurisich, dated Oct 23, two days before she was towed out to head to Mexico. P345-346 – Discussion re deadlines to remove the ship from the SBRF before CG incurs additional storage costs. This was impacted by the government shutdown orchestrated by Congress that fall that prevented the ship from being moved at the beginning of the month. While the shutdown stopped the ship from being moved, it also kept us from getting any official help with the ship as any government authorities we could appeal to were not working. P347-351 – Tersely worded email from Jeff Beach dated 9/27/13 disagreeing with GSA officials that the failure to move STORIS from the SBRF was because the move was beyond the control of the buyer. Beach points out that he believes the delay was caused by the buyer holding the ship at the SBRF to avoid the costs of moving the ship to a commercial berth. Beach is concerned as the Oct 1 fiscal year cutoff is looming and the potential costs to the CG were appx $70K if the ship was not moved. As it was, she stayed in the SBRF for almost an entire additional month and there has never been any revelation as to whether or not the CG or any other party had to pay for that extra storage time. The email he is responding to is P 348-49. Beach requests in his email of Sep 25 that the sale be voided and control of STORIS returned to USCG. P 352-353 – Correspondence between USCG and US State Department to certify that the STORIS is decommissioned and has been removed from service. This is supporting documentation to go along with the export license associated with a demilitarized vessel. P 354-355 – Correspondence between MARAD and USCG re storage fees if the ship isn’t moved by Oct 1. This is mirrored in earlier documentation. P 356-361 – More discussion about legalities related to the State Department export license process, as discussed above. P 364-370 – Question from Jeff Beach to GSA asking how to handle inquiries from CG Vets regarding who bought the STORIS. Heather Bischoff tells Beach that he shouldn’t tell anyone who bought the ship, that interested parties should file a FOIA with GSA. Again, so much for government transparency in the enlightened Obama Nation. P 371-372 – A report indicates that oil is found on board the ship, an estimated 100 gallons (obviously they didn’t check the ESDG tank as that alone had a hundred gallons in it according to layup instructions). This necessitates a COFR. P 373-374 – Discussion among GSA staff about the official definition of a museum group. STORIS Museum didn’t meet the qualifications to be called a museum. GSA officials couldn’t seem to wrap their heads around the concept that we needed the ship to open a museum as the ship herself was to be the facility. At one point, they seemed to accede to that point and insisted they would work with us…that is until they found the Section 106 MOA. Then everything was off. P 375-383 – A very important exchange between Beach at CG and the dim bulbs at GSA. The discussion revolves around hull cleaning requirements if the ship is to be moved from the SBRF and restrictions for foreign scrapping. The discussion indicates that there were no clear answers on the hull cleaning and no restrictions on foreign scrapping. The foreign scrapping issue was patently false. There are federal laws on the books that should have prevented STORIS from being allowed to go to Ensenada for breaking (again, §3502 of the Duncan Hunter NDAA of 2009). The discussion once again brings up the seriously flawed documentation created by the flawed testing for haz-mat on board STORIS (as well as ACUSHNET, done at the same time following the same testing regimen). They claim there was no asbestos on board the ship (false) as well as no PCBs (also false, based on the age of the vessel and because of statements from her last crew that testified otherwise). GSA should never have been involved with STORIS as her tonnage of 1,710 exceeded the agency’s legal purview of 1,500 tons (40 USC 548). P 424-425 – A very important document that shows that GSA did not unilaterally make the decision to sell STORIS for the $70,100. Tonya Dillard sends a message to Jeff Beach late on the night the auction closed asking if the CG would accept the below reserve bid. There is also some discussion about the sales description of ACUSHNET. P 426-427 – Discussion about inspection dates on board the ship for the auction. The original dates extended past the auction close, so the dates were adjusted backward to accommodate the true auction period. P 432-435 – Story about the ship going up for auction in the Seattle paper. P 436-438 – More emails regarding the STORIS Museum FB post asking bidders to stay away. P 439-444 – Discussion between GSA and CG about the auction and GSA turning down an expressed interest in claiming STORIS by a Naval Sea Cadet representative (affiliated with our efforts through The Last Patrol group in Toledo). GSA was not going to help us in any way, shape or form. Their position is patently false as Sea Cadet groups have claimed surplus Coast Guard property many times in the past. P 445- 454 – More discussion about the auction particulars and the Naval Sea Cadet group’s expression of interest in the ship. This goes along with the two-year transfer period that GSA originally said it would take us to claim the ship, as told to Jim Loback of the STORIS Museum. That was obviously a lie from GSA. Jim had been told that the nonprofit claim period would be run after the federal and state period. Instead it was run concurrently with the state period. P 455-468 – Miscellaneous discussion about auctioning off some excess 55-foot CG boats, with STORIS added as an afterthought. Apparently the CG and GSA people are easily confused when a computer refuses to cooperate with what they want in terms of data entry when listing a property for sale. In this exchange, Heather Bischoff makes off-hand comments about “officially” involving historic preservation officials from the GSA and CG. As already discussed, the validity of following a seven-year-old agreement is in question, especially with the change of circumstances with STORIS officially listed on the National Register of Historic Places. Bischoff even acknowledges the risk to the ship if she leaves federal ownership. Section 110 of the National Historic Preservation Act – the very same law that gave GSA the out for Section 106 – strongly encourages the preservation of nationally significant historic properties, especially if being transferred from federal ownership to private. There is also the matter of a former government ship being allowed to go to a foreign yard for breaking. But like any good government bureaucrat, they just cherry picked what they wanted to follow. There will most certainly an appeal filed to follow up with this release.